Whether you are planning your own wedding or using a professional wedding planner, you are probably looking for a way to make your special day unforgettable. The problem is that so many of the more traditional wedding ideas have been used so often that they no longer have much to offer. It can seem as though everyone has simply run out of ideas, but this doesn't have to be the case. 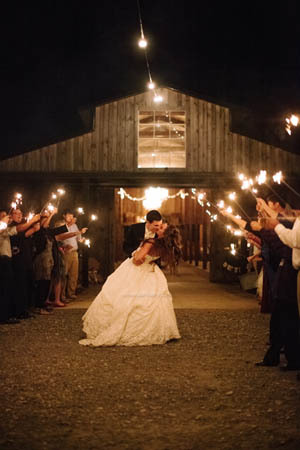 One of the best ways to light up your wedding exit is to give everyone in your party wedding sparklers. Wedding sparklers are available in a range of sizes starting with 10-inch and going all the way up to 36-inches in length. While the smaller ones can provide a little light and fun, there is nothing quite like the extra burn time that 36-inch sparklers have to offer. These are among the most popular sparklers for sale today and are guaranteed to make everyone in your party delighted. In fact, these wedding sparklers are sure to have everyone in you party begging to know where you found them. Consider these three reasons why you should consider buying these long sparklers instead of the many shorter wedding sparklers for sale. No wedding is complete without kids of all ages (from 6 to 60), all of whom are sure to enjoy the bright spectacle created by using extra-long sparklers. No one can resist the bright shower of sparks produced by these long-burning sparklers, they are sure to delight. Whether you are worried about the younger members of your wedding party or someone's wedding dress becoming damaged, there is nothing to worry about. The sparks that are given off are harmless, making these the perfect choice instead of hard rice that can end up in people's eyes. While sparklers are great for just about any special occasion, there is nothing better than using long burning wedding sparklers to create the perfect wedding send off. If your wedding is taking place outside, nothing looks as wonderful as lighting up the evening sky with long burning wedding sparklers. Imagine how romantic it would be to walk through a tunnel of light, created by your guests holding their sparklers overhead to light your way off to a fantastic start in your new life as husband and wife. What a great way to take your wedding to the next level! If this sounds good to you, look no further than long burning extra-long wedding sparklers. They are fun, safe, and the final touch to your special day that is sure to create the kind of memory that will last you and your guests a lifetime.